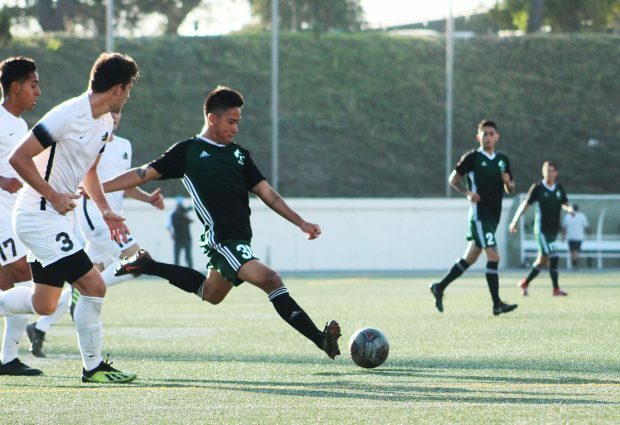 In a game where both teams showcased their best defensive skills, East Los Angeles College defeated Rio Hondo College 1-0 at the Weingart Stadium yesterday. Since the first minutes of the game, ELAC and Rio Hondo set the defensive tone of the game. In a counter attack where ELAC recuperated the ball in the midfield, Brazilian freshman midfielder, Paulo Macedo Nahashique scored the only goal of the game from the 10 yard mark. Nahashique said in Portuguese it was a difficult game, but they managed to win, and that’s what’s important for the team. Nahashique also said the goal was scored out of luck because he wasn’t wearing the right cleats. ELAC used defensive tactic where they let Rio Hondo counter attack, and took advantage of Rio’s mistakes to counter-attack them. “We were countering their (Rio Hondo’s) counter attacks. We’re sitting back and letting the team attack us so when they make a mistake we can attack them,” assistant coach Ricardo Raygoza said. One of ELAC’s predominate defensive players was sophomore midfielder Sergio Chaidez, blocking dangerous passes in the midfield. “Before the game, coaches told us to come out strong, keep the pressure, keep the intensity and to not slack off. We kept the pressure during the game. We did a good job and got the win,” Chaidez said. Rio Hondo countered many times in the first half, but all of the ELAC team served as defenders. In the second half, Rio Hondo came out stronger offensively, having three opportunities to score within the first 10 minutes. In minute 81, Rio Hondo freshman midfielder received an arial pass where he tried to score a header, but the ball was blocked after it hit the back of the head of Nahashique. After failed attempts to score, Rio Hondo players frustration was noticeable, as they committed several aggressive fouls. ELAC took advantage of Rio Hondo’s frustration, and played its best offensive moments toward the end of the game. Husky sophomore forward Rene Sanchez entered the game and had two opportunities to score. The first time Sanchez received the ball in the left wing, he passed defenders and sent a pass, but Rio Hondo freshman goalkeeper caught the ball in time to prevent a goal. “It looks like we maybe didn’t attack as much, but it’s also a soccer strategy to defend very well to win a game like this,” Raygoza said. After the win, ELAC now stands 9-8-5 overall. The Huskies next opponent will be on Friday against Pasadena City College, and will play them away.